The chart above debunks a few myths that we have been hearing regarding Eurobond flows, SI55 and SI33. It also shows that the current problems are largely self-made. I say largely because it is worth bearing in mind that the credit downgrade was a combination of severe worsening of fiscal position (huge public sector wage rises), poor execution of monetary policy, political uncertainty and increased borrowing, within a cocktail of declining copper prices and tapering of US credit. Another possible impact [abolishing SI55] of course is that the lack of monitoring framework may now mean that foreign mining companies and other business will continue with their activities of under-declaring profits. It may also mean that if you have large cash this may now be the time to take it out of the country or leave it abroad rather than incur the political risk under the PF government, given PF's tendency to make up policy at a whim! That may actually not only lead to more money going abroad but it may even weaken the Kwacha further in the medium term. The larger picture of course is that Kwacha will continue to fall because of largely what the IMF has called "home grown risks". And also due to ongoing tapering of US credit and falling copper prices. 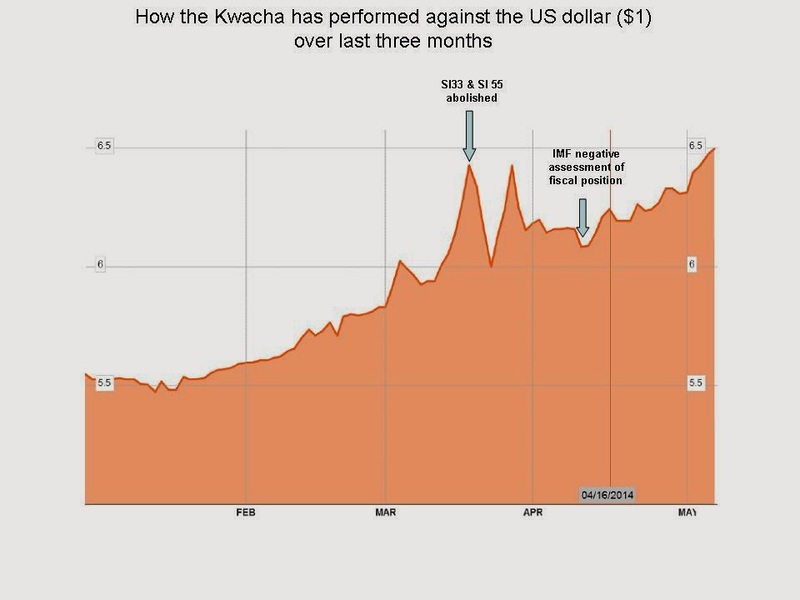 What impact is this continued depreciation of the Kwacha going to have on the economy? A weaker Kwacha means GRZ debt repayments will continue to become more and more dearer. And of course with potential credit downgrades going forward the cost of repayments will be higher. At the individual level, the impact of weaker Kwacha is being felt through higher cost of imports, mostly for consumption purposes, but some significant ones for production as well! We have seen fuel prices rises and this will become amplified. The elasticity of imports becomes crucial here, but needless to say, oil is a critical input for mining production costs, and a weak exchange rate, means higher domestic production costs for other sectors not least general transportation. That said, a weaker Kwacha continues to keep open the window of competitiveness for non-mining sectors especially agriculture produce. The real question is whether the Zambian economy has diversified enough in recent years to take advantage of this window. We have seen some signs of diversification, but in general this remains aspirational. For one thing as I have previously argued, diversification requires money (see Five Questions on Diversification). And that is one thing Zambia does not have. The copper price, after its initial to $6500 at the beginning of April 2014, has steadied and increased slightly to about $6600 per MT as of today. Yet there has been no corresponding strengthening of the Kwacha in that time. This would add to the point that the problem with the currency is more home grown than dependence on external factors such as the international price of copper. Diversification has been talked about for years. It seems to be something that cannot move forward. I wonder if it is because it can be viewed as another shade of the idea of import substitution and the tendency to tariffs and eventual increase of price in the domestic market for locally produced product. My point is that some local based manufacturers don't engage in these option successfully because they want more profit than they can get if the tariffs are not excessive. Their profit margin expectations are too high so they will not invest. Just thoughts. But often the local product is too expensive for something that was produced locally. Mealie meal is perhaps an example.